I have had flowers once for Valentines Day, my boyfriend who subsequently became my husband bought me a bunch of anemone. They were handed to me with aplomb and pride, they were the most beautiful jewel like colours, with wilting heads they had not seen water for an hour or two. But I felt very special, after all I was only 21 years old. My working day involves helping couples resolve relationship issues. One intriguing aspect of this work is the unspoken expectations people may have of one another. When it comes to Valentines Day, do we send anonymous cards to our loved ones, do we expect to get one in return, do we sulk if we don’t. Is there an expectation that each year we will routinely send a single red rose to show the love one person may have for another. Perhaps we expect these gifts as a declaration of our love for one another. But maybe its the gift of togetherness and acceptance of one another is the greatest gift of all. I was shopping in a large supermarket this week and spotted the large bunches of beautiful Red Roses. My instinct is to check the scent, alas there was none. These roses were perfect in shape and form and had an almost unnatural look about them. I recently acquired a small book, The Prophet by Kahlil Gibran. This short excerpt is relevant to us all who love and love gardening. I chose this cottage because it is a Home literally in the middle of nowhere on the Isle of Arran Scotland. It has no electricity and the water supply is from a stream nearby. It is home to someone who left a message to say they had sailed away and will be back one day. It is called Lagan Cottage which is close to Lagan Farm once the home of the McMillan family. Harold McMillan was Prime Minister of UK. This was taken on the Isle of Arran on the west coast of Scotland. It sits on the edge of the Ben Tarsuinn Ridge and can be seen for miles. It is composed of well weathered granite and lots of imagination. I think it is nature showing us how unique she can be. Most of the country has had a sprinkling of snow. Some areas have been cut off and these are only a twenty minute drive from where I live. One village had four foot drifts, the main road impassable for a time. It seems we had a lucky escape in South Pembrokeshire. The only observation I could make of impending bad weather was the lack of bread in the Supermarket. Why? I chose to go for a long run on saturday morning, this was a road run and running through one of the villages closer to the coast I noticed Daffodil in bloom on the edge of the beautiful village. The residents obviously take pride in their gardens. One keen gardener has created a lovely border on what would normally be wasteland on the roadside. They have recently been mulching the border with rich and well decomposed leafmould. This morning I chose a shorter run on the coastpath itself. Although the temperature was zero, the windchill made it feel like minus 5. The Pembrokeshire Ponies were nowhere to be seen, opting for the more sheltered wooded areas. There are about twelve mares in foal and in the Spring its an absolute delight to watch the newborn foals orientate themselves with their wibbly wobbly legs that look too long for their body size. There are signs of dare I say Spring, I noticed the Ramsons are beginning to sprout in my garden but more excitingly the snowdrops are beginning to make an appearance. The Iris reticulata I planted in a little container have not let me down. This year I put a little heater in my greenhouse,I invariably loose some of more tender plants. I acquired an Aeonium, not sure which one but it has started to flower in the warmth, I’m not sure if that means its putting all its energy into flowering and will die or whether I can remove the flowering stems once finished flowering and it will regenerate, I can but wait. I have been reading Ancient Trees by Edward Parker and Anna Lewington. I am so taken with the beliefs in the mystical forces of trees. The Oak is associated with the Norse and Germanic gods of thunder and lightening and Lime trees are associated with fertility. These beliefs are present in some societies today and the good luck charm of ‘Touching Wood’ according to the author of Tree Wisdom Jacqueline Memory Paterson states that this is a ‘direct continuation of the action of our Celtic ancestors’ who would touch and commune with trees when in times of need. It is a beautiful book and full of knowledge and wisdom, definitely for cold days by a log fire. My blog will be having a makeover next week, I really need to organise my photos better. Out for a long walk yesterday I brought my new camera with me to experiment and play with my new toy. I realise I love photographing fungii and unusual shapes. 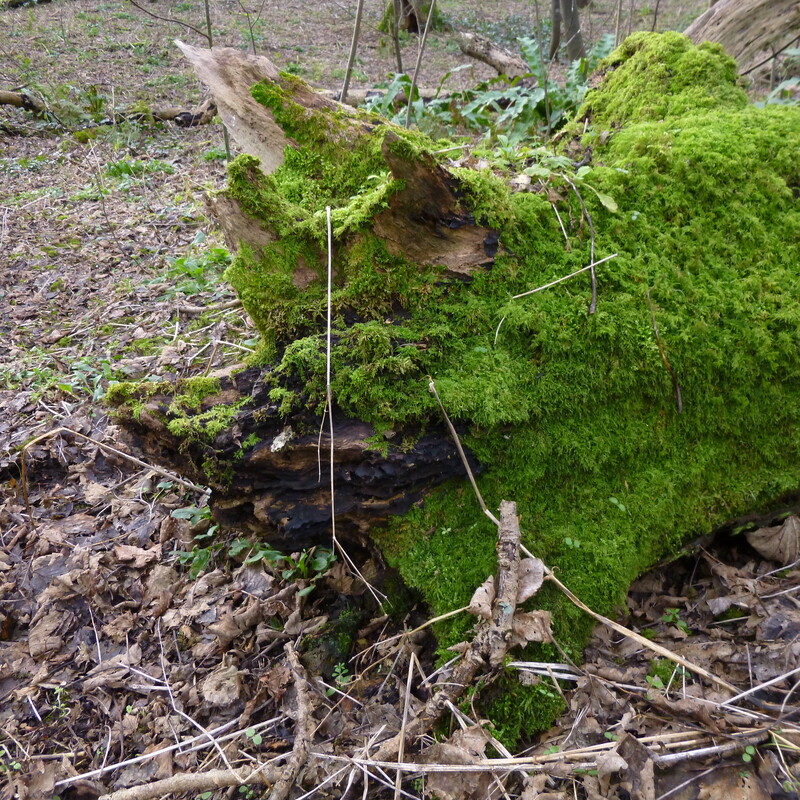 The shape of the moss covered log reminded me of a wild boar just resting after a truffle hunt. The wood itself is an area I have been running through for many years. Having the opportunity to take my time and take in the smells of the damp forest floor, with its leaf mould to die for. It is possibly centuries old there is evidence of an old iron age fort there. A standing stone nearby called the Devil’s Quoit, it is sometimes shrouded in ivy wreaths and wild flower chains, possibly from Winter Solstice or Mid Summer Celebrations. I came across the fungus and could not resist the opportunity of a picture. I love the shape of the cups, for me it has memories of fairytales when I was a child. 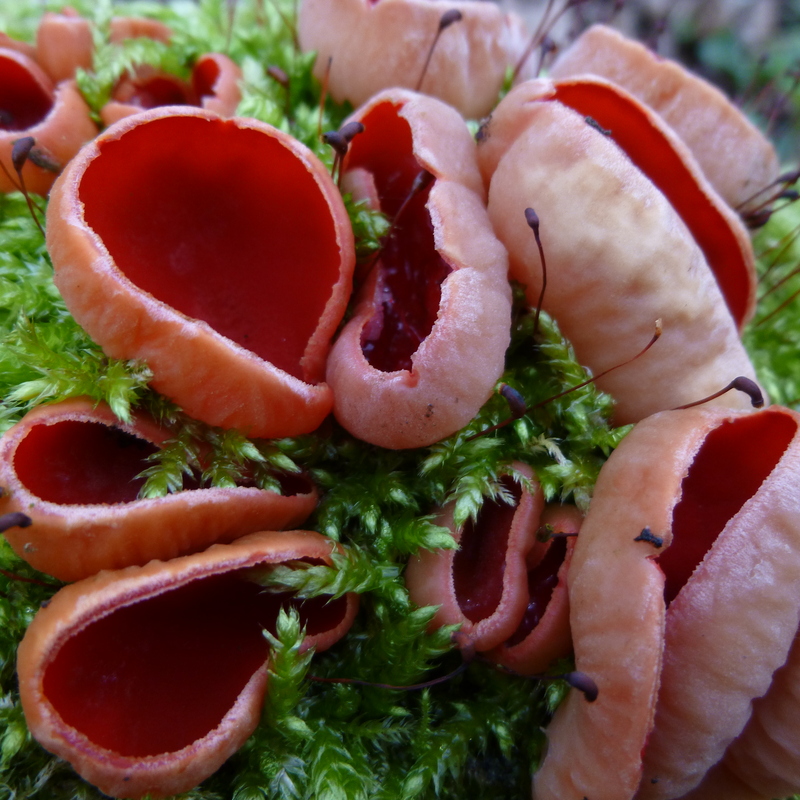 The sphagnum moss was a lovely contrast to the red colour of the inner shell of the fungii. The moss with its filaments with tiny seed heads I had not noticed whilst framing the picture. We made our way onto the lily ponds, with its winter residents Goosander and Goldeneye swimming up and down in pairs with a sense that courtship was being displayed. The causeways leading onto the lily ponds have been flooded recently and not accessable a sign of climate change, even so it is the most beautiful part of Pembrokeshire even on a cold day in January. I just can’t quite remember that last time we had a day of sunshine. We have had a bit of, now you see me now you don’t but nothing constant. I am itching to spend time in my garden to get an overview of its shape and form once again. I am observing how trees create a wonderful framework to a space. They majestically hold their own, taking ownership of the space both above ground and of course sending their masterful roots beneath the ground to gather moisture. My garden is bordered on two sides by traditional British trees, Hazel that produce cob nuts, Sycamore aka the Pembrokeshire Weed, Ash and Hawthorn sprinkled here and there. The Ash trees must be well over fifty years old judging by the girth. I have concerns about the aggressive new disease caused by the fungus Chalara fraxinea that is affecting Ash and I am keeping a good eye on my prize possessions. Another beautiful tree I have an affinity for is the Birch Tree or Betula. The Betula pendula were already established in the garden when we moved here thirty five years ago in March. The previous owners planted three trees in close proximity and since they are shallow rooted have suffered from dry spells we have had in recent years. They are such graceful trees and enhanced by interesting bark. My favourite has got to be Betula utilis var jacquemonti, its the Armani of trees, its slender and stylish and definitely stands out from the crowd with its glorious white bark. Some purists actually wash the bark to keep it pristine, alas, I am not a bark washer. Finally the largest tree in my garden is a beautiful oak, we found it growing from an acorn when we moved here. It graciously stands sentry like in the back garden protecting the Garden Room. It delightfully accepts a hammock slung from its strong branches in warm, dry weather. I cannot quite remember the last time I managed that, but I am hopeful.I have just ordered Anna Lewington Ancient Trees to learn more about the mythical and religious significance of trees. Something to look forward to in the coming weeks.